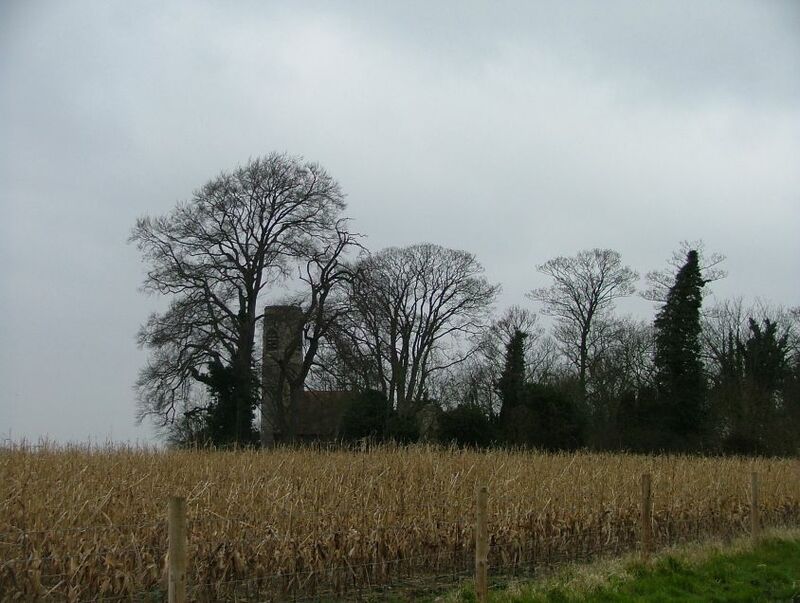 Here we are on the frayed outer edge of south Norwich, but this little church feels as remote as any in East Anglia, especially when a sky the colour of lead has come down to almost meet the soft land. As it would turn out, this would be just about the only dull, grey day in a March full of sunny weather, but it strangely suited this part-ruin on top of a hill, a few hundred metres from the nearest road. No doubt it is down to those cunning people at the Norfolk County Council planning department, but you don't have to get far from the city to feel in the middle of nowhere. There isn't really a village to speak of, and the parish is a joint one with neighbouring Intwood, so you might think it very obscure. 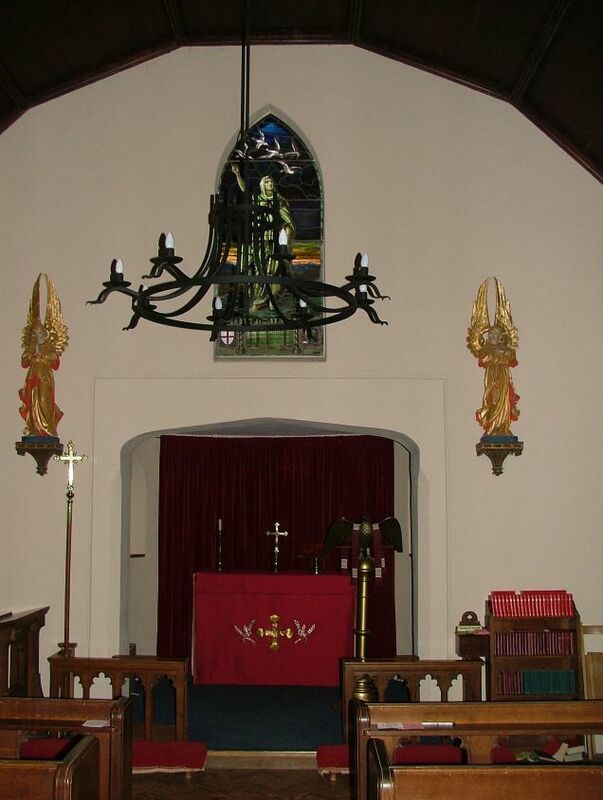 But later, I mentioned my visit to an Anglican clergyman friend of mine in Ipswich, and he had fond memories of the place, because Keswick Hall was where many East Anglian clergy trained for the Priesthood when it was a theological college. Keswick Hall had been the home of a less famous branch of the Gurney family, and it is them we have to thank for this church. 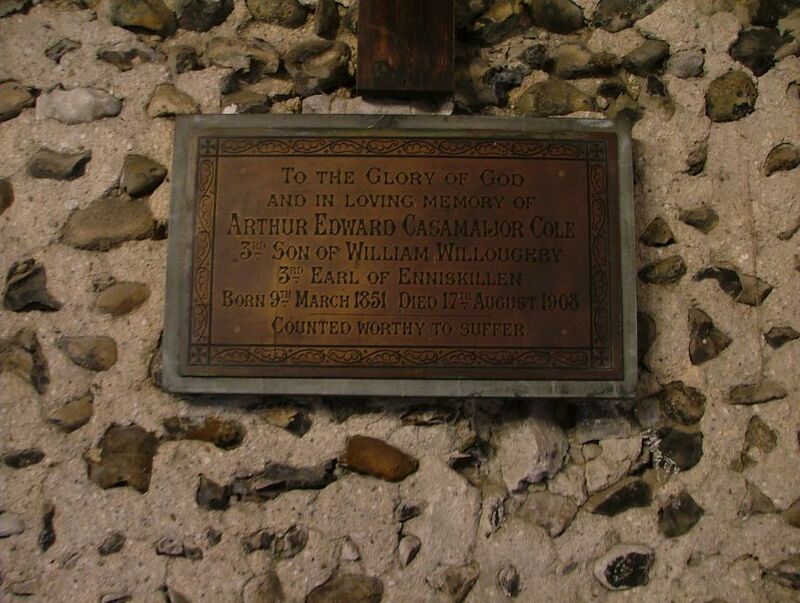 As so often in Norfolk, the 16th century change from Catholic sacramental worship to Anglican congregational worship meant that Norfolk had far more churches than it could possibly ever need, and All Saints fell into disuse. In 1598, Henry Hobart, on his way to building Blickling Hall, bought the manors of Keswick and Intwood. 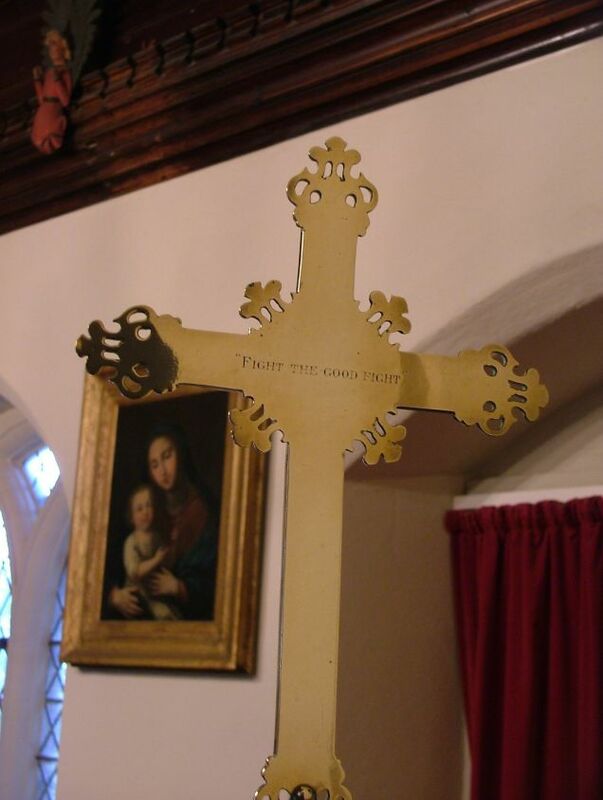 Installed at handsome Intwood Hall, he rebuilt the church there with materials from Keswick. 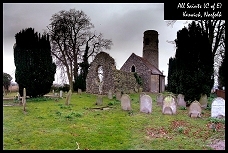 Then, a full three hundred years later, The Gurney family restored the ruin of All Saints as their mortuary chapel. 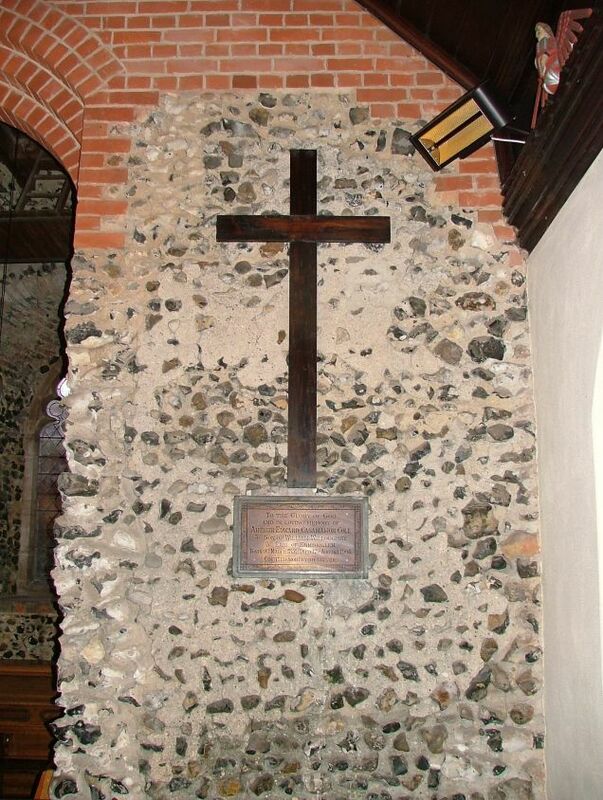 By the 1920s, perhaps as a result of the post-WWI triumph of Anglicanism, the chapel was refurbished and reintroduced as a church, almost four hundred years after last seeing service as one. 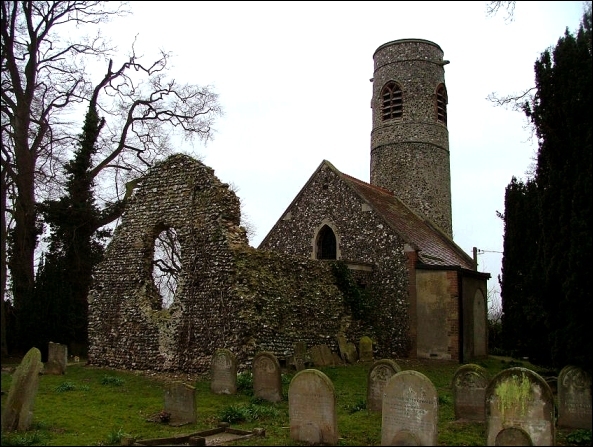 Externally, you can see that this has always been a tiny church. 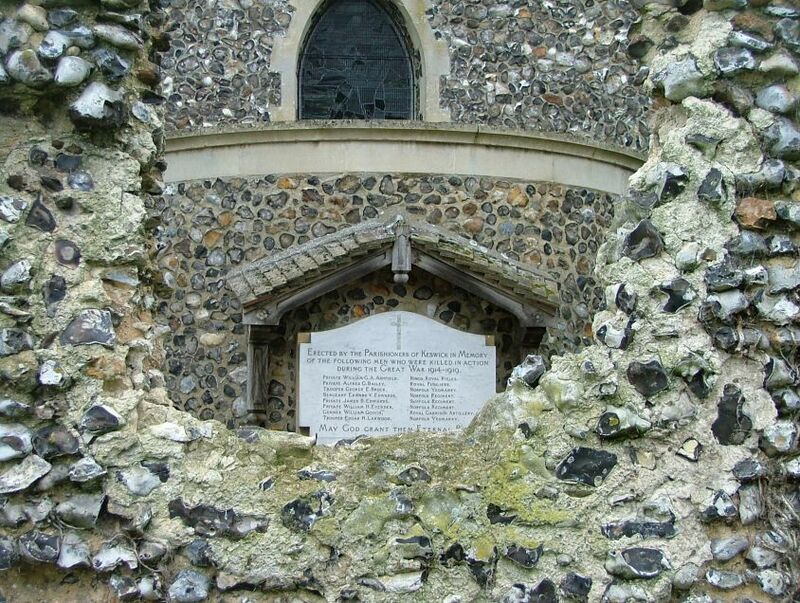 Until the 1890s, the east side of the round tower was a gaping hole looking out onto the shell of the chancel. 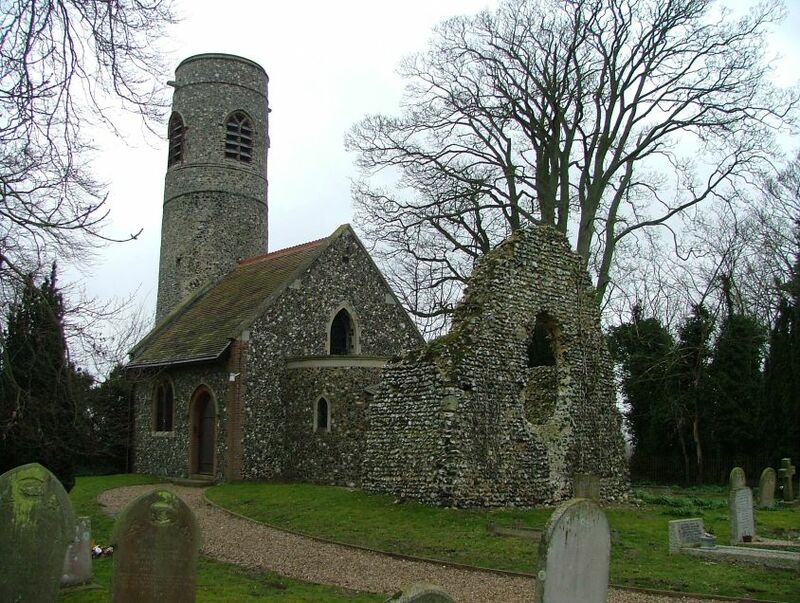 The Gurneys built their new church against the tower, and it is no more than six metres long. 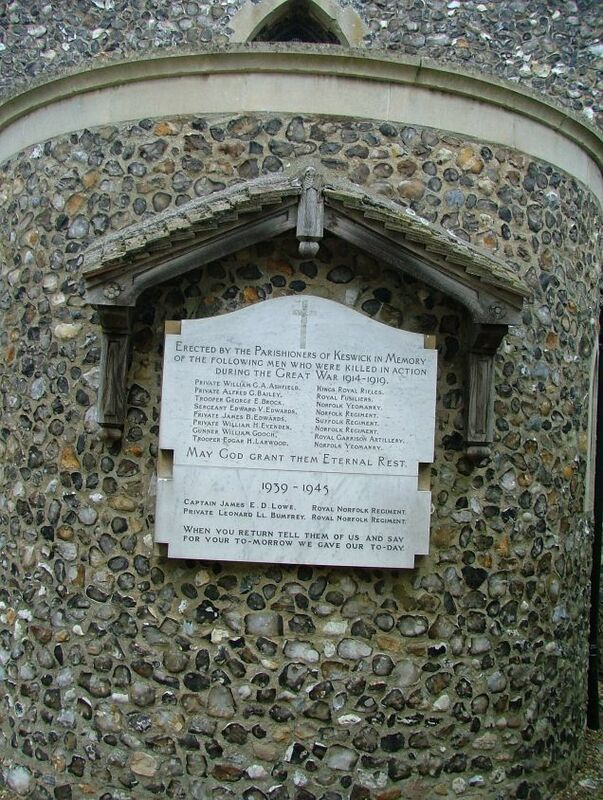 In the 1950s, a rounded apse was added, and the Keswick war memorial reset on the outside of it. 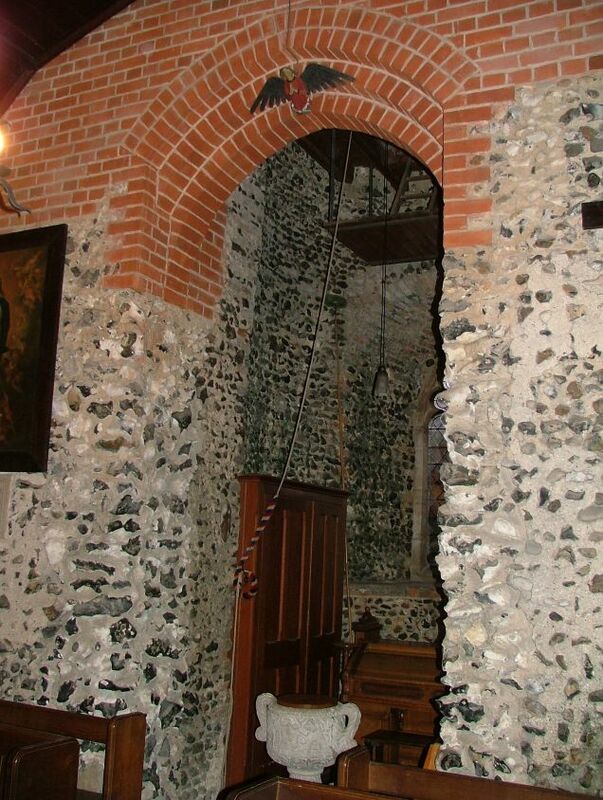 You step into a delightful, tiny space, the hole in the tower filled with red brick to form a new archway. Benches accentuate the fact that the nave is slightly wider than it is long, and above the 1950s apse is a window depicting Hope by the William Morris workshop. 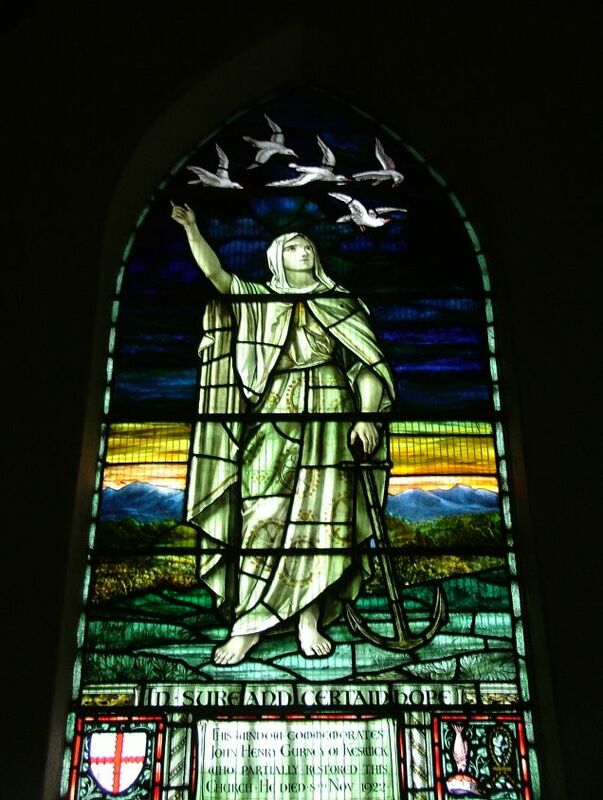 In the literature, nobody seems to have a kind word to say about this window, but I thought it was rather good. 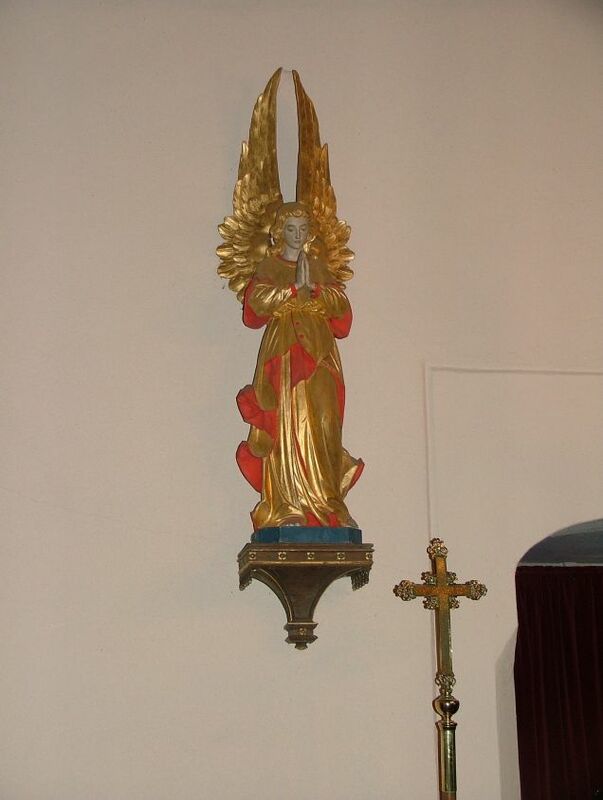 There is a pleasing devotional feel to the interior, angels which may originally have been intended for riddell posts flanking the tiny sanctuary, red and gold used to good effect. 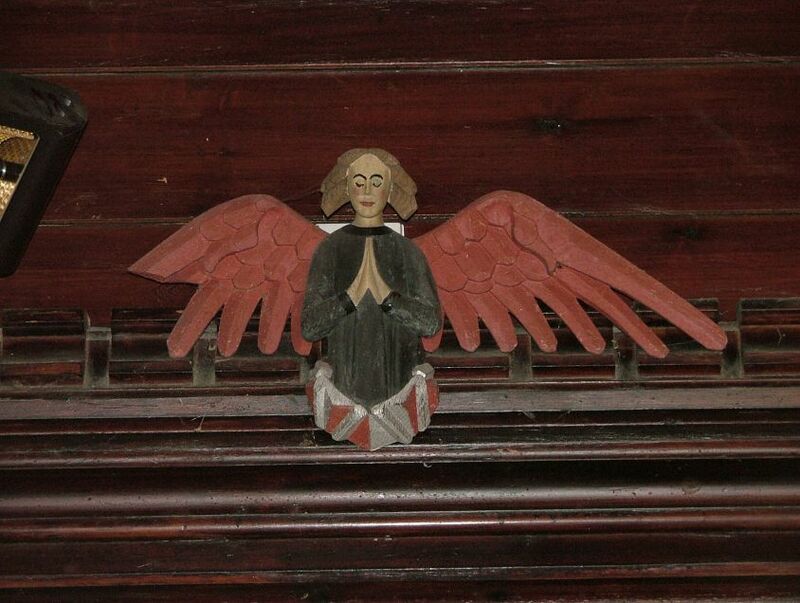 The angels in the roof look as if they are restored medieval ones. I wonder where they came from? As for the font, I have never seen anything quite like it. 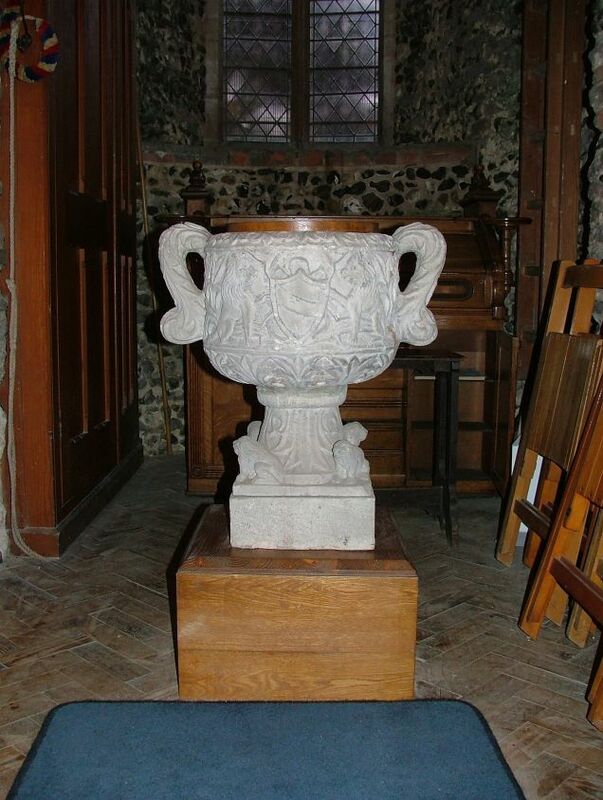 I couldn't decide if it looked more as if it had come from an Ancient Greek temple or a garden centre. But being unusual it suits this tiny space, which is quite unlike any other. 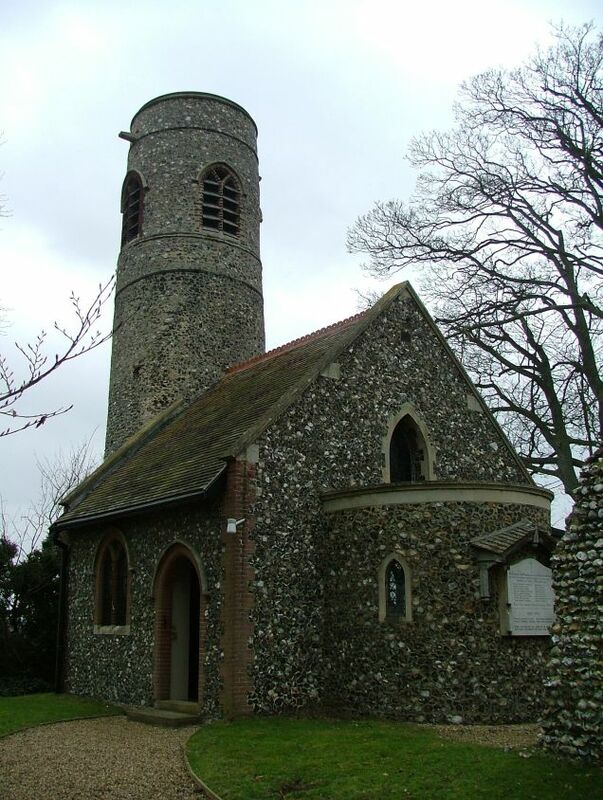 Keswick may not be the smallest medieval church in Norfolk - I think Santon may take that prize - but Santon is redundant, and Keswick is surely the smallest Anglican church still in use in East Anglia. And such a delight.